Since the Android event that was to take place this morning was cancelled due to Hurricane Sandy, we were wondering whether or not we would see any changes in Google Play this morning. Many retailers across the country are now selling the 32GB Nexus 7 for $249 and the 16GB version for $199, so you would think that Google would have to change their own listing in some way. Well, they have, by making both the 8GB and 16GB models of the N7 no longer available. To take it a step further, the 16GB version is now listed as “Not for sale at this time” and the price for it has been completely removed. The 8GB model is still showing as “Coming soon!” and with a $199 price. 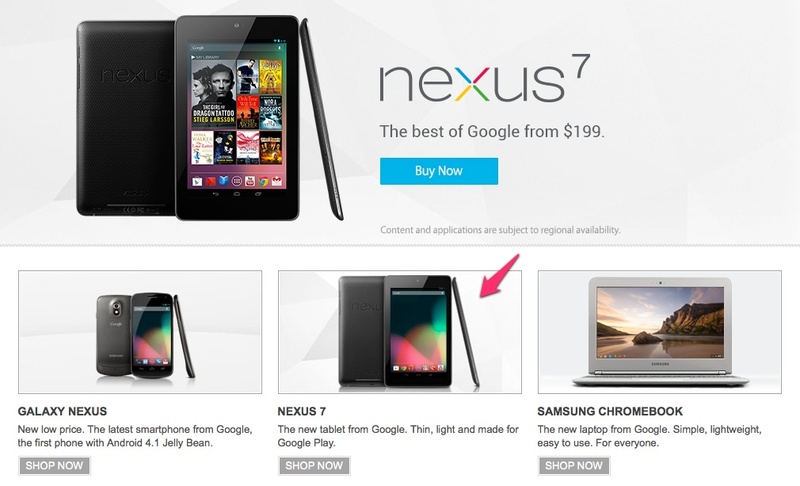 On a related note, one of our readers also noticed that the photo for the Nexus 7 on the Google Play Devices page has been updated. It’s a photo of the tablet alright, but it’s showing a new variation of a wallpaper that was originally released with Jelly Bean. It’s also sticking out like a sore thumb with a fully white background that none of the other device pictures are using. Changes are happening, we just don’t know when they will fully happen. Since the event was cancelled, you would think that Google is going to have to say or do something.